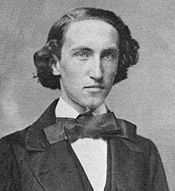 Josiah Willard Gibbs (February 11, 1839 – April 28, 1903) (generally known as J. Willard Gibbs) was a preeminent American mathematical-engineer, theoretical physicist, and chemist noted for his contributions to physical chemistry and statistical mechanics. He introduced the "phase rule," which predicts the number of phases that a substance can manifest at a particular temperature and pressure. He devised much of the theoretical foundation for chemical thermodynamics as well as physical chemistry. As a mathematician, he was an inventor of vector analysis. The American Mathematical Society has described him as one of the greatest scientists America has ever produced. 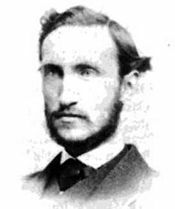 Josiah Willard Gibbs was the only son and the fourth of five children of Josiah Willard Gibbs, a professor of sacred literature at the Yale Divinity School, and Mary Anna Van Cleve Gibbs, the daughter of a Yale graduate. Gibbs's father is known as the person who found an interpreter for Africans aboard the "slave ship" Amistad, thus facilitating their release. After attending the Hopkins School, Gibbs matriculated from Yale College at the age 15. He graduated in 1858, near the top of his class, and was awarded prizes in mathematics and Latin. In 1863, Gibbs was awarded the first Ph.D. degree in engineering in the U.S. from the Sheffield Scientific School at Yale. His dissertation was on, "The form of the teeth of wheels in spur gearing," a problem that he reduced to one of planar geometry. He tutored for three years at Yale, two years in Latin and one year in natural philosophy, or what is today called physics. In 1866, he toured Europe for three years, accompanied by two of his sisters. Gibbs spent a year each in Paris, Berlin, and Heidelberg, where he was influenced by Gustav Kirchhoff and Helmholtz. At the time, German academics were the leading authorities in chemistry, thermodynamics, and theoretical natural science in general. These three years account for nearly all of his life spent outside New Haven. In 1869, Gibbs returned to Yale, and was but marginally employed. He tutored engineering students in French for a semester, and worked on improvements to the governor of the Watt steam engine. In 1871, he was appointed Professor of Mathematical Physics, the first such professorship in the United States and a position he held for the rest of his life. The appointment was unpaid at first, a situation common in Germany and otherwise not unusual at the time. The chair had not yet been endowed, and Gibbs was known to have inherited a large sum after the deaths of his parents. In 1873, Gibbs published a paper on the geometric representation of thermodynamic quantities. The purpose of this paper was to demonstrate that one could as clearly represent the physical laws associated with thermodynamics through a graphical presentation as by analytical formulae. These papers came to the attention of Scottish physicist Maxwell, who included and expanded upon Gibbs' presentation in a later edition of his own work on heat. Maxwell was inspired to make a plaster model applying Gibbs' graphical formulae as it applied to water. He sent the finished work to Gibbs. It is now in the possession of Yale University. Between 1876 and 1878, Gibbs wrote a series of papers collectively titled On the Equilibrium of Heterogeneous Substances, now deemed one of the greatest scientific achievements of the nineteenth century and one of the foundations of physical chemistry. In these papers Gibbs applied thermodynamics to interpret physicochemical phenomena, successfully explaining and interrelating what had previously been a mass of isolated facts. The concepts of chemical potential and free energy, the energy available to do work, a concept also introduced by Helmholtz. A Gibbsian ensemble, any ensemble of masses following the laws of dynamics and treated statistically. It is a generalization from an ensemble of molecules in a gas, the statistical treatment of which formed the material for the kinetic theory of gases. The Gibbs phase rule. This rule predicts the number of states a material or a mixture of materials can exist in at a particular temperature and pressure. Willard Gibbs’ 1873 available energy (free energy) graph, which shows a plane perpendicular to the axis of v (volume) and passing through point A, which represents the initial state of the body. MN is the section of the surface of dissipated energy. Qε and Qη are sections of the planes η = 0 and ε = 0, and therefore parallel to the axes of ε (internal energy) and η (entropy) respectively. 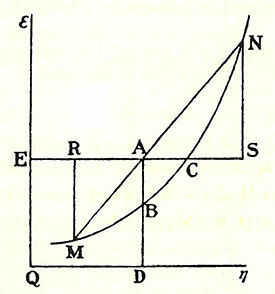 AD and AE are the energy and entropy of the body in its initial state, AB and AC its available energy (Gibbs free energy) and its capacity for entropy (the amount by which the entropy of the body can be increased without changing the energy of the body or increasing its volume) respectively. Gibbs also wrote on theoretical thermodynamics. In 1880, the new Johns Hopkins University in Baltimore, Maryland, which had begun to expand its physical sciences department, offered Gibbs a position paying $3000 annually. Yale responded by finally offering him a salary amounting to $2000. Gibbs took Yale's offer, and remained in New Haven. From 1880 to 1884, Gibbs combined the ideas of two mathematicians, the quaternions of William Rowan Hamilton and the exterior algebra of Hermann Grassmann to obtain vector analysis (independently formulated by the British mathematical physicist and engineer Oliver Heaviside). Quaternions were an extension of complex algebra that had analogies to, and that could therefore be applied to the study of, physical phenomena. In 1881, Gibbs distributed an unpublished pamphlet with an introduction to vector analysis. Gibbs found Hamilton's calculus of quaternions awkward, as it introduced a scalar quantity with no geometric interpretation. Gibbs retained some of the quaternion notation in the form of the unit Cartesian vectors i, j, and k, while introducing notation of his own, such as using "X" as the multiplication symbol for the cross product of two vectors. In 1884, he distributed additions to his pamphlet that expressed the relationship between the differential and integral calculus and vectors. Five years later, Gibbs applied his vector methods to the determination of planetary orbits in a paper titled, On the Determination of Elliptic Orbits from Three Complete Observations, a problem that many of the great physicists, from Isaac Newton on down, had addressed. In this work, Gibbs sought to demonstrate the power of vector analysis "by showing that these notations so simplify the subject, that it is easy to construct a method for the complete solution of the problem." Gibbs' new method was soon applied by astronomers to establish the orbit of Swift's comet. Gibbs delivered an address to the American Association for the Advancement of Science, in 1884, in which he coined the word "statistical mechanics." to mean, not just the theory of colliding molecules in gases, but any assemblage of bodies treated using the calculus of probabilities. From 1885 to 1889, Gibbs refined his vector analysis, wrote on optics, and developed a new electrical theory of light. He deliberately avoided theorizing about the structure of matter, developing instead a theory that did not depend on a particular concept of the construction of matter, although he was by no means against the atomic theory. After 1889, he further developed statistical mechanics, laying a foundation and "providing a mathematical framework for quantum theory and for Maxwell's theories." In his last decade of his life, the only work he completed was a classic textbook on statistical mechanics, published by Yale in 1902. In 1901, Gibbs was awarded the Copley medal of the Royal Society of London for being “the first to apply the second law of thermodynamics to the exhaustive discussion of the relation between chemical, electrical, and thermal energy and capacity for external work, using statistical models. Rudolph Clausius, Maxwell, and Ludwig Boltzmann also contributed to the foundations of statistical mechanics. Gibbs never married. He lived in the home inherited from his parents with his sister and brother-in-law, the Yale University librarian. His focus on science was such that he was rarely available personally, and certainly did not reach out for social interaction. He could be seen around the Yale campus taking daily walks, but would do so undisturbed. Gibbs died April 28, 1903, in New Haven, and was buried in the Grove Street Cemetery there. Recognition for Gibbs' ideas was slow in coming, in part because Gibbs published mainly in the Transactions of the Connecticut Academy of Sciences, a journal edited by his librarian brother-in-law, little read in the United States and even less so in Europe. At first, only a few European theoretical physicists and chemists, such as the Scot James Clerk Maxwell, paid any attention to his work. Only when Gibbs' papers were translated into German (then the leading language for chemistry) by Wilhelm Ostwald in 1892, and into French by Henri Louis le Chatelier in 1899, did his ideas receive wide currency in Europe. His theory of the phase rule was experimentally validated by the works of H. W. Bakhuis Roozeboom, who showed how to apply it in a variety of situations, thereby assuring it widespread use. In his later years he was a tall, dignified gentleman, with a healthy stride and ruddy complexion, performing his share of household chores, approachable and kind (if unintelligible) to students. Gibbs was highly esteemed by his friends, but American science was too preoccupied with practical questions to make much use of his profound theoretical work during his lifetime. He lived out his quiet life at Yale, deeply admired by a few able students but making no immediate impress on American science commensurate with his genius (Crowther, 1969). Some believe that Gibbs had fully established the ideal of the "Christian gentleman" in his humble and reserved way of life. Yet, it would not be accurate to state that Gibbs was unknown in his day. Mathematician Gian-Carlo Rota, while casually browsing through the mathematical stacks of Sterling Library at Yale, stumbled upon a handwritten mailing list attached to Gibbs' course notes. It listed over 200 of the most notable scientists of Gibbs’s time, including Henri Poincaré, David Hilbert, Ludwig Boltzmann, and Ernst Mach. One may infer that Gibbs' work was better known among the scientific elite of his day than public records suggest. In 1945, Yale University created the J. Willard Gibbs Professorship in Theoretical Chemistry, held until 1973, by Lars Onsager, who won the 1968 Nobel Prize in chemistry. There is a J. Willard Gibbs Professorship of Thermomechanics presently held by Bernard D. Coleman at Rutgers University. On February 28, 2003, Yale held a 100th anniversary symposium in Gibbs' honor. The American Mathematical Society established the Josiah Willard Gibbs Lectureship in 1923, to increase public awareness of the aspects of mathematics and its applications. Nobelist Paul Samuelson described Gibbs as "Yale's great physicist." J. W. Gibbs Laboratory at Yale and The J. Willard Gibbs Assistant Professorship in Mathematics at Yale are named in his honor. On May 4, 2005, the United States Postal Service issued the American Scientists commemorative postage stamp series, depicting Gibbs, John von Neumann, Barbara McClintock, and Richard Feynman. Gibbs' primary achievements came roughly a decade before the work of the early Nobel recipients. Gibbs contributions, however, were not fully recognized until well after the 1923 publication of Gilbert N. Lewis and Merle Randall’s 1923 Thermodynamics and the Free Energy of Chemical Substances, which introduced the methods of Gibbs to chemists world-wide, and upon which the science of chemical engineering is largely founded. The work of German physicist Max Planck, winner of 1918 Nobel prize in physics, in quantum mechanics, particularly his 1900 quantum theory paper, is largely based on thermodynamics of Rudolf Clausius, Willard Gibbs, and Ludwig Boltzmann. In 1970, American economist Paul Samuelson, who championed the application of Gibbs' statistical methods to economics, won the second Nobel prize in economics. ↑ American Mathematical Society, Josiah Willard Gibbs Lectures. American Mathematical Society. Retrieved February 29, 2008. ↑ Jeremy Brecher, The Real Amistad Story. Retrieved August 15, 2007. ↑ Michael J. Crowe, A History of Vector Analysis (Notre Dame: University of Notre Dame Press, 1964), p. 160. ↑ J. J. O'Connor and E. F. Robertson, J. Willard Gibbs. Retrieved August 15, 2007. ↑ American Philosophical Society, 1903. ↑ J. Willard Gibbs Professor of Thermomechanics - Rutgers University. Retrieved August 15, 2007. ↑ Yale University, J. Willard Gibbs and his Legacy: A Double Centennial. Retrieved August 15, 2007. ↑ Nobel Prize, How I Became an Economist. Retrieved August 15, 2007. American Institute of Physics. 2003 (1976). 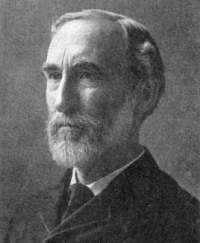 Josiah Willard Gibbs. Retrieved August 15, 2007. Bumstead, H.A. 1903. "Josiah Willard Gibbs" American Journal of Science XVI(4). Crowe, Michael J. 1967. A History of Vector Analysis. Notre Dame: University of Notre Dame Press. 150-161. Google. Elementary Principles in Statistical Mechanics. Retrieved August 15, 2007. Hastings, Charles S. 1909. Josiah Willard Gibbs. Biographical Memoirs of the National Academy of Sciences. 6:372–393. Moyer, Albert E. 1983. American physics in transition: a history of conceptual change in the late nineteenth century. The History of modern physics, 1800-1950. Los Angeles: Tomash Publishers. 3:97-105. Wilson, Edwin Bidwell. 1931. Reminiscences of Gibbs by a student and colleague. Scientific Monthly. 32:211-27. John J. O'Connor and Edmund F. Robertson. Josiah Willard Gibbs at the MacTutor archive. Jolls, Kenneth R., and Daniel C. Coy, "Gibbs models." Iowa State University. History of "Josiah Willard Gibbs"